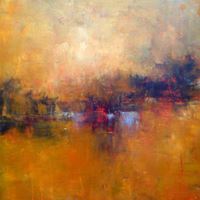 Join this fun class and learn the oil & cold wax process of creating abstract work through the use of layers and color interaction. Utilizing cold wax medium, tube oil paint, pigment sticks and a variety of implements we will find new ways to create textures and mark making, along with expressive, richly surfaced paintings. You are encouraged to use alternatives to brushes such as brayers, palette knives, silicone scrapers and squeegees for this class. All artists are invited. Please bring oil paints and Arches oil paint paper 12x16. Cold wax will be provided.